Full Peruvian "Caviar" Accoyo is an outstanding Herdsire. Caviar is a 3rd generation True Black Suri herdsire out of HHSF Peruvian Accoyo Hershey. "Caviar" is a Grand Champion's Son. Hersey took home 1st Place at AOBA's National Show along with many more 1st at well respected and Nationally known shows. Hershey certainly is impressive as well as being the only 1/2 Accoyo 1/2 Alianza True Black operating Herdsire in the United States. All of "Caviar's" Offspring have been outstanding!! 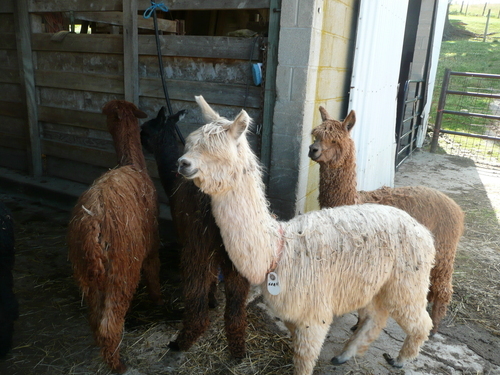 Caviar's show record includes 1st Place AOBA Southeast PA Show, 1st Place 2003 Ohio Alpaca Fest, and 1st place 2004 Kentucky Classic. Caviar's genetics also include such greats as: Accoyo Uribe, Accoyo Yodel, and Accoyo Yolanda. Caviar's fiber is tight, shiny locks, with some of the greatest twists we've seen yet. Unbelievable outstanding structured locks blanket his coat; uniform throughout there is no doubt to the majesty of this great Herdsire. Caviar has proven to be an outstanding herdsire with phenomenal cria on the ground who continue to place at the top of their class. 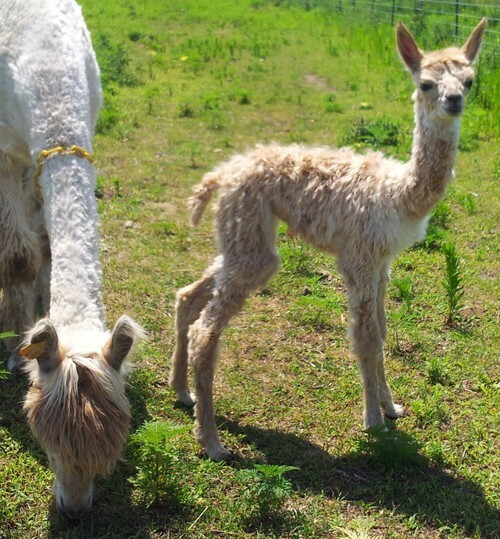 We are very impressed with his excellent luster and lock production on all of his cria, we love his consistency. True Black Peruvian Uribe FULL Accoyo Suri lines---very nice! 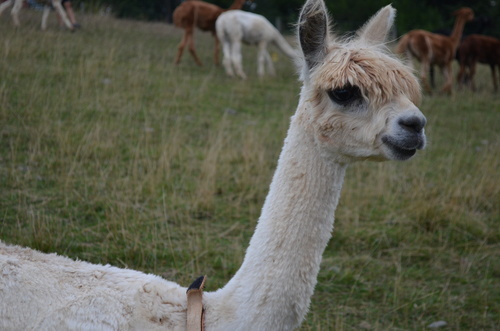 Every time a Peruvian Caviar cria hits the ground they have his stature, fleece and disposition. We feel he is one of the most consistent show quality producers. 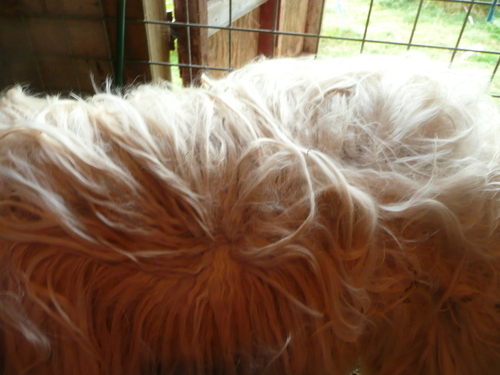 NOVEMBER is a beautiful female that is Full Peruvian. She recently had a beautiful True Black male who looks just like his Daddy, True Black Alpaca Trading’s Ignite. November has very fine, yet dense fiber with a great hand and a super disposition. Just check out her pedigree. 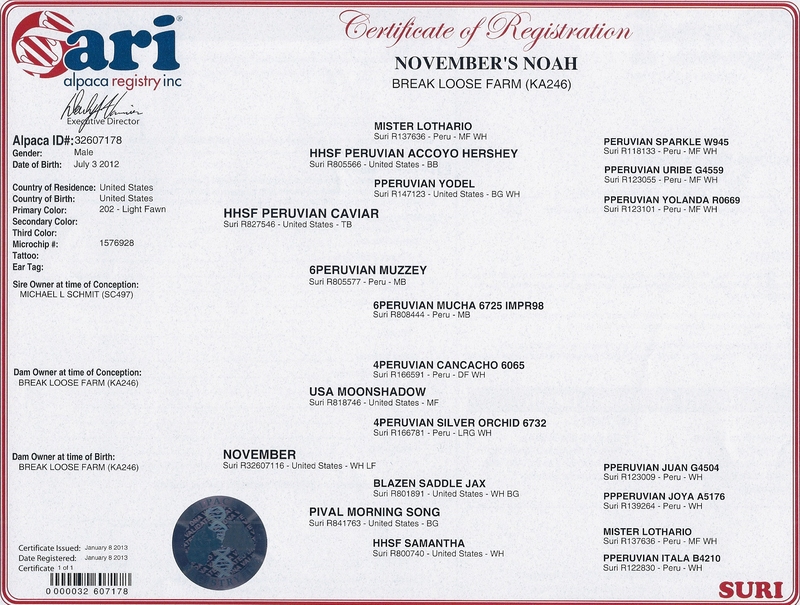 Sweet November also has handsome light fawn yearling son, Noah, from HHSF Peruvian Caviar. Fine pencil locks with so much sheen!!! November's Noah is very light fawn and has fine pencil locks with super sheen. Beautiful Suri face and pleasant personality.